Clay is a type of soil produced by the metamorphosis of rock that is naturally rich in mineral salts. It is found in major or minor deposits and, in most cases, extracted from open-cast pits. It was the first natural medicine known to Man and has been used for centuries for its therapeutic benefits. Clay stands out from other elements in that it is both absorbent and adsorbent – meaning it can exchange absorbed impurities and toxins for beneficial minerals. 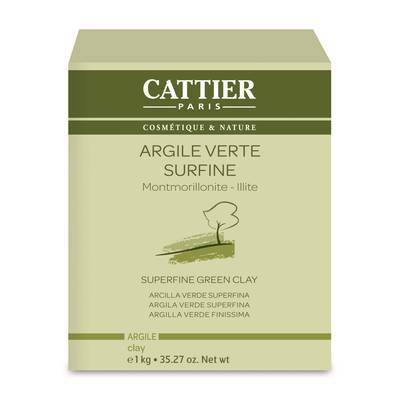 The Superfine Green Clay Cattier, extracted in France, in environments protected from any contamination, has been chosen for its incomparable quality. Its properties have been improved by the action of the sun. Clay is used for masks, poultices and clayey water. Absorbent, purifying and regenerating, Cattier Ultra-ventilated Green Clay is especially well-suited to the care of combination to oily skins. It absorbs and regulates excess sebum, eliminates toxins and impurities, revitalises the skin and encourages cellular renewal. It also has antiseptic and softening properties.